“Flipping The Switch” is aptly named, jolting Halt And Catch Fire’s third season forward. From its very first episode, Halt’s been able, for all its missteps, to pull off a big moment, and “Flipping The Switch” adds a few more. There’s a lot to like about all these moments, a consistently satisfying confluence of performance, writing, direction, and, yes, music. (The Heads might be on the nose, but it’s the sort of “go big” effect that works here in spite of itself.) Toby Huss and Annabeth Gish make a great, cagy team as Bos and Diane size each other up while easily outfoxing the young guys trying to hoodwink them. (Huss makes such delicious meals out of lines like “It’s a figure that was arrived at when we were operating with less than current information” that the only response is pure happiness.) The Mutiny gang continues to make the young company’s squabbling exciting. With all we know about the four major players there, their head-to-heads always smack of genuine invention—you can practically see sparks. And Joe’s manipulation of Ryan, ending with that particular big moment, is as compelling throughout as it is customarily baffling. I spoke last time about Halt And Catch Fire’s Joe problem. Without rehashing things too much, Joe is whatever each season of Halt needs him to be—even if the Joe we get from episode to episode doesn’t hold together in the long run. Last episode was Joe as supervillain, crushing Gordon, poaching Ryan, and then crushing Gordon again by proxy on Ryan’s way out the door. That Joe was in line with the Joe we saw at the end of the season premiere—the bearded Silicon Valley guru, making speeches and peddling ideas that, as ever, imply hidden plans, and hidden costs. Here, we get some of supervillain Joe at the outset. He’s got poor Ryan chasing goals that seem to exist only in Joe’s head. “Hey man, what did you hire me for?,” blurts the bewildered Ryan after once again failing to guess what’s expected of him. “I’m beginning to wonder that myself,” responds Joe aridly, before snapping his headphones back in place and walking away. Like he did with Gordon years before, Joe sets himself up as tough-love teacher, here dropping Ryan into a board meeting and affecting disdain when Ryan won’t stand up against the board’s plan to start charging for Joe’s “free to all” home computer security program, Citadel. 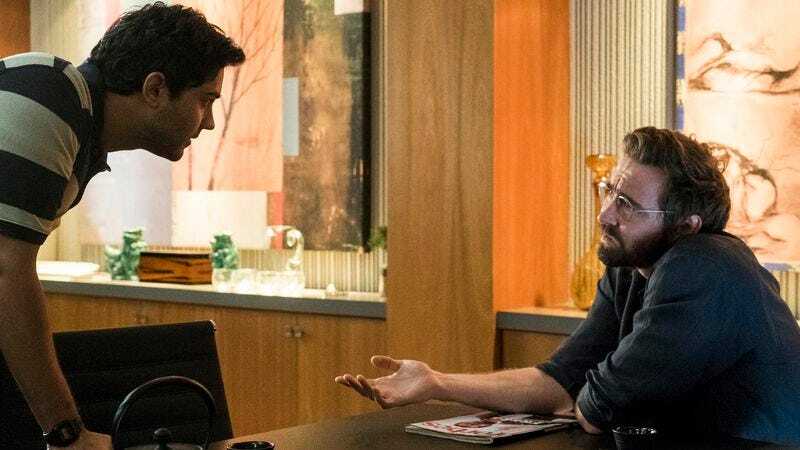 It’s only when Ryan confronts him later about betraying his stated vision that Joe offers a hint of the approval Ryan craves, finally coming to Ryan to help MacMillan Utility invent “a new income stream” to offset the fact that Joe’s not going to charge for Citadel after all. But then there’s the Joe who answers Ryan’s outrage over charging for Citadel ($14.95/year) with a wistful look and platitudes. (“You said freedom from fear is a right and you shouldn’t have to pay for it!” “In a perfect would that would be true.”) The Joe who gazes ruefully over his Forbes cover with the headline, “Free?” and is then revealed to be teaching himself BASIC because, as he tells the surprised and dubious Cameron, “Maybe I just got tired of being told I’m just a salesman who couldn’t code.” Last week, Joe was nakedly manipulating events with an icy malevolence. This week, he’s donning a baseball cap to hide his identity while he learns rudimentary coding and affects the ennui of a man who’s found his success has left him empty and tortured. It’s all very entertaining to watch—as long as you recognize that there’s no center to Joe MacMillan as a character. He’s either playing a game, or he’s having a crisis of faith in himself, or some combination thereof. Ambiguity’s fine, but with a character as rootless as Joe’s always been, it continually makes the big reveal, when it comes, a lot less impactful. On the other hand, poor Gordon’s desperate need to feel useful and important has turned him into a walking contradiction—and time bomb. Feeling left behind at Mutiny, he looks backward to his antiquated ham radio and isolates himself even further, cramming in behind the Clarks’ winter coats. It’s untenable, as Gordon’s repeated, frustrated outbursts at the Mutiny meetings—which Donna halfheartedly invites him to—show. “I just don’t want you to think I can’t self-start,” he protests feebly to Donna, but, while Gordon’s got ideas (Cameron concedes that his technical advice is solid, and Bos agrees with his assessment that Cameron’s too busy to go back to full-time coding), he’s still Gordon. Stomping home in a snit from Mutiny, he hears someone on the radio and rushes to answer. When we next see him, he’s spilling his marital troubles to a stranger, the contents (and door) of the coat closet strewn all over the hallway. The first time we ever saw Gordon, he was being picked up from the drunk tank by Donna, and that image of the restless half-genius destined to fall on his face has only solidified as Gordon’s failures and humiliations mount up. Scoot McNairy has always made Gordon’s also-ran status deeply sad, and exasperating. Gordon’s always on the verge of insufferable—tonight, his inability to stop bringing his self-pity and passive-aggressive needling to the Mutiny board meetings makes everyone want to throttle him—but McNairy finds a core of painful self-knowledge in Gordon that makes him at least relatable. The show’s world rewards quick, decisive action. People are always talking about missing the train, being left behind. Gordon—a brilliant guy with some great ideas—knows in his heart he’s always going to miss that train. Coupled with his health woes, Gordon’s inability to make the right choice at the right time keeps twisting him out of shape. When Donna comes home after a long day at work tonight, she sits in her car, looking stricken at the thought of having to deal with whichever Gordon is going to greet her. Still, all’s not lost for the Clarks, as Halt And Catch Fire continues to navigate their relationship without falling prey to cliché. For all Gordon’s faults, he and Donna are still palpably connected. The moment where Donna waves off Cameron’s hyperbole about meeting the heads of Swap Meet “a gazillion times” by showing Gordon an unseen-by-Cameron two fingers is adorable, and McNairy and Kerry Bishé act with such intimacy that the ever-shaky Clark marriage is hardly the doomed enterprise it sometimes appears. (Their pantomimed signals to each other while Gordon tries to apologize to Bos and Cameron is similarly telling.) Upbraiding Ryan for trusting Joe, Cameron refers to Donna as “the nicest woman on the planet,” but Bishé’s brought Donna a long way from the flat “worried wife” character she was initially stuck with. That moment in her car, Donna’s lunch-drinking with Annabeth Gish’s happily divorced Diane, her momentary tipsy freedom while goofing around with Bos back at Mutiny—Donna’s getting a taste for the more unfettered existence that comes with her growing success. When Bos counsels “There’s men out there who’ve done a lot worse,” Bishés response (“It’s hard to turn that into good news”) watches Donna’s momentary escape crash down on her. In some ways, Halt And Catch Fire is still playing catchup, rooting out bugs left over from its initial conception. But, like the gang at Mutiny, it’s exciting in an episode like this one to watch the process and wonder if everything’s going to come together in the end. Mackenzie Davis may have the best stare on television. Half incredulous, half threatening, with her mobile mouth blaring red underneath, it’s a potent weapon in Cameron’s arsenal, and, as in her confrontation with Ryan, often deadpan hilarious. “It never happened.” “It so clearly did.” “It’s a thing you say!” I love the comedy team of Bosworth and Cameron. For all her supportive words, Diane still goes to the Swap meet meeting with Bos, despite Donna’s assertion that Bos could do it alone.